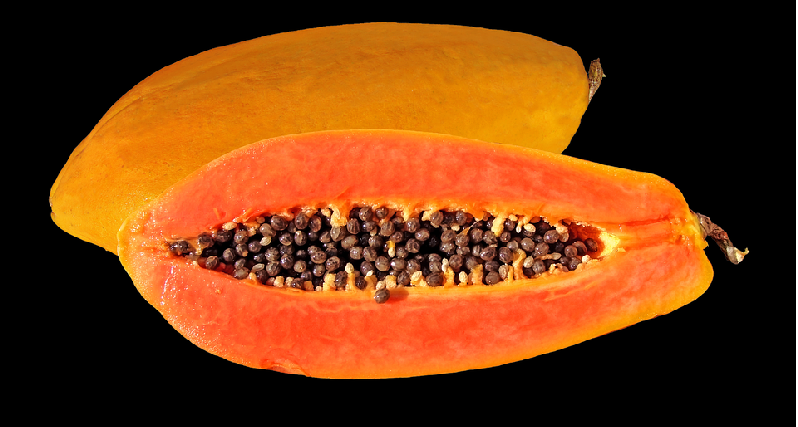 Papaya is rich in papain, a digestive enzyme that helps the body break down protein. Do you ever eat too much, and then it hurts? Or maybe you don’t eat too much – but it hurts anyways? Or maybe it’s gas and bloating… reflux… ? When you eat food, before you absorb its nutrients, you need to digest it first. But what does that mean? Simply put, digesting is the process of breaking big pieces of food down into smaller pieces. First comes physical digestion, which is sort of like grinding or blending. This is what our teeth are for, and the churning action in our stomachs. Then there’s chemical digestion, where we disassemble food on a molecular level. This is where enzymes come in. We produce our own digestive enzymes. We produce an enzyme called amylase in our saliva that breaks complex carbohydrates (starches) down into simple carbohydrates (sugars). We produce pepsin, which breaks down protein, in our stomach. We produce a whole variety of enzymes in our pancreas, which get dumped into our small intestine. And we produce even more enzymes in our intestinal walls. If all’s going well, we produce enough. When we don’t, however, we can experience indigestion. GERD (Gastro-Esophogeal Reflux Disease), when food isn’t cleared from the stomach quickly enough, and “backs up” the food pipe. General digestive malaise, especially in the form of stomachaches. We can also free more enzymes by avoiding foods that inhibit them. Nuts, especially, but to a certain extent seeds and grains as well, contain natural enzyme inhibitors. These enzyme inhibitors are in place to keep the nutrients locked up, so the nut doesn’t sprout on the tree, or the grain doesn’t sprout on the stalk. So what you need to do is simulate the condition in which the nut or the grain should sprout: basically, get them wet. So if you have a hard time digesting nuts, try soaking them overnight before eating. Or buy ones that have been pre-soaked for you. We can also eat or drink bitters. The bitter taste reflexively stimulates digestion. You can get a little bottle of herbal bitters, and add some to a glass of water before meals. Or eat a lightly dressed dark green salad, with lots of bitter radicchio and endive, before a heavy meal. Or have a strong shot of coffee. And then, finally, there are enzyme supplements to simply take with meals that are hard to digest. In the olden days, most enzyme supplements came “straight from the source,” i.e. an animal’s pancreas. These days, the vast majority are vegetarian. But they still replicate enzymes we’d make in our own bodies. Most enzyme pills are made up of a variety of enzymes, to digest a variety of nutrients. Pectinase, alpha-galactosidase, beta-glucanase, hemicellulase, maltase, and xylanase all break down specific, hard-to-digest sugars and carbohydrates. DPP-IV™ is a brand-name enzyme that breaks down gluten and casein. Even these specialized enzymes will usually be combined with others. At the end of the day, enzymes are not a “deep” medicine in the sense they fix any “deep” problem on a “deep” level. In fact, they’re pretty superficial. But that’s the great thing about them: you don’t need to have a real problem to enjoy the relief you get from digestive enzymes. All you need is a Thanksgiving dinner. What else do digestive enzymes do? On an empty stomach, digestive enzymes may help reduce inflammation or break up congestion. This is largely a benefit with the proteases. And it works much, much better on an empty stomach, when you take them away from food. Honestly, if this is your goal, you might do better to look for an enzyme that specializes in this, vs. the ones geared towards digestion. Lipase on an empty stomach may help with lymphatic congestion and swollen glands. What’s the difference between an enzyme and a probiotic? Which one should I take? Should I take both? Probiotics are living bacteria which colonize our small and large intestine, and also help us digest food, as well as support healthy immunity, provide cofactors for hepatic detoxification, reduce long-term disease risk, line and protect the intestinal walls, and keep us regular. Enzymes work on the meal you take them with; probiotics work longer-term. Enzymes are more about function; probiotics are more about structure. Enzymes are more about digestion; probiotics are more about elimination. Back in the first or second grade, we did an experiment in class. All the little students had to chew up a piece of cracker, and then hold it in our mouths for five minutes. By that point, it had started tasting sweet. That was the salivary amylase breaking down the complex carbohydrates (starches) into simple carbohydrates (sugars). I won’t get into the kind of strength you’re looking for, because there are so many ways of measuring an enzyme’s strength, and it can get awfully complicated, awfully fast. (Suffice it to say the Essential Enzymes product from Source Naturals is a nice low-moderate strength enzyme, and a good value. The Digest Gold from Enzymedica is a very good high-powered enzyme). Please note that like all enzymes, DPP-IV™ is not 100% effective. So if you’re dealing with celiac disease, or ASD that responds to a casein-free diet, DPP-IV™ will not take the place of avoiding these foods.